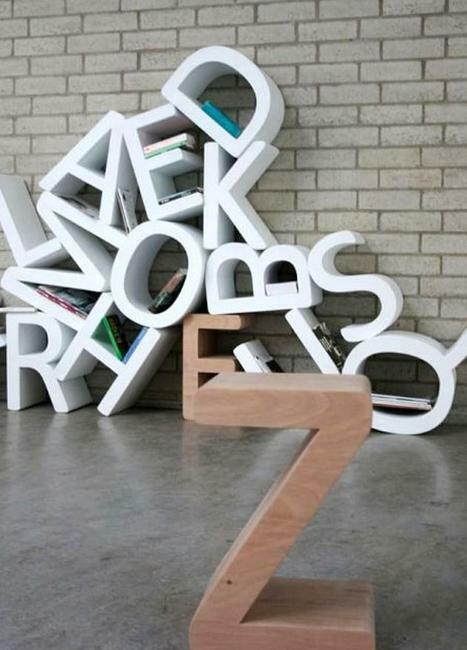 Modern wall shelves show unusual and original design ideas, reflecting favorite themes, bringing meaningful words and unique shapes into interior decorating. 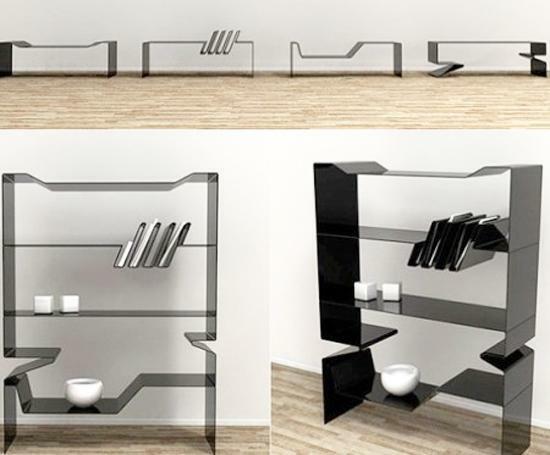 Modern wall shelves are offering functional, attractive and convenient storage ideas. 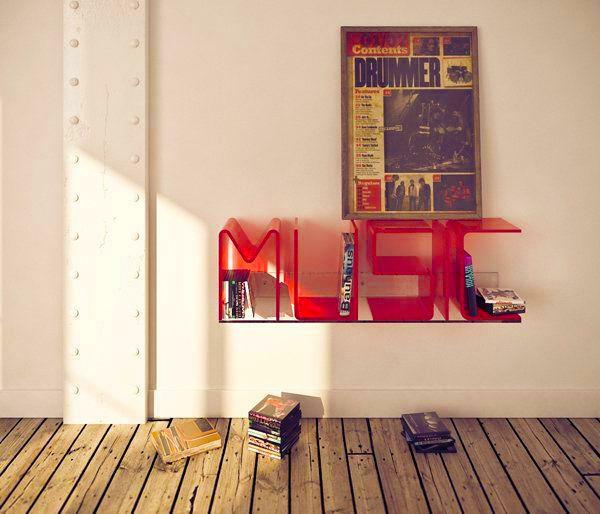 Lushome shares a collection of interesting design ideas that create unique and modern wall shelves. 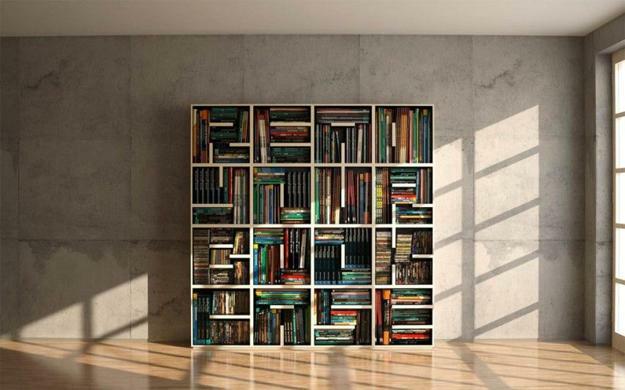 Modern wall shelves demonstrate novel design ideas and are turned into contemporary artworks and home decorations. 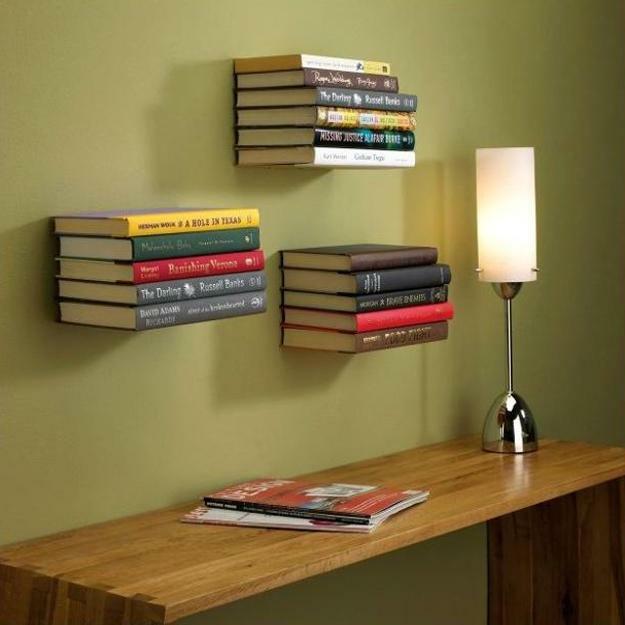 The functionality and usability of some design ideas are less important that the look of these wall shelves which makes a statement and add striking accents to interior decorating. 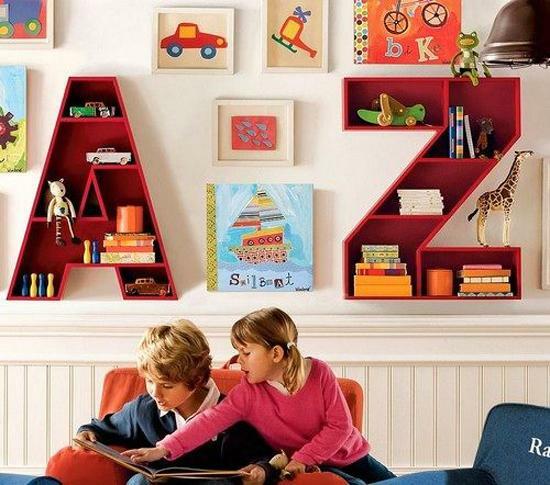 Creative wall shelves surprise and delight, blending traditional and novel, mixing unusual design ideas with convenient storage organization and creating interesting visual contrasts. 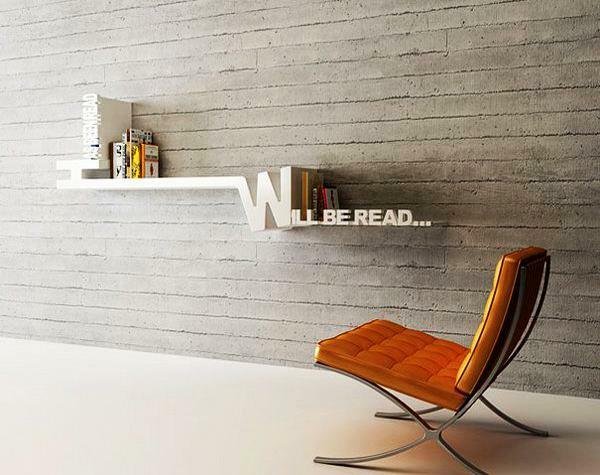 Modern wall shelves can be made with wood and metal, glass and bricks. 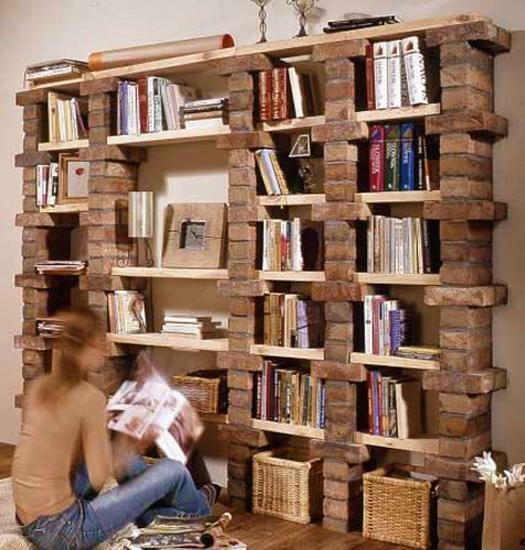 Book storage ideas can be truly unexacting and whimsical. 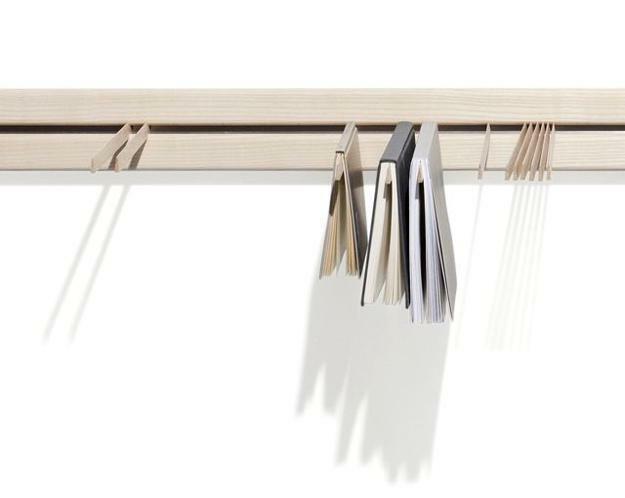 Dede Dextrous Design studio moved away from the traditional perception of book storage and proposed a new system which is called Fa.B bookcase with hangers for books. 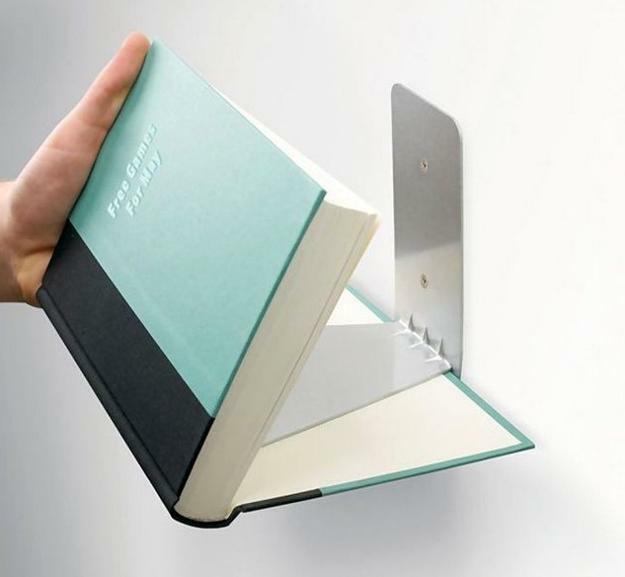 Pockets are made of dirt-repellant material to protect the books and give each book its own space in the collection. 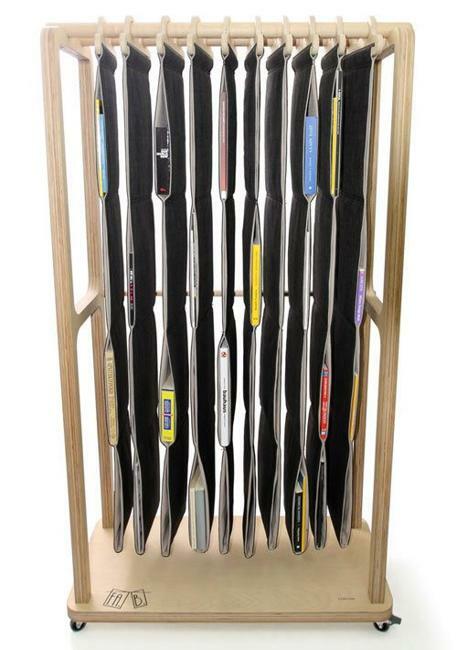 Designer Jakob Jorgensen offered his design idea for unusual book storage and organization. 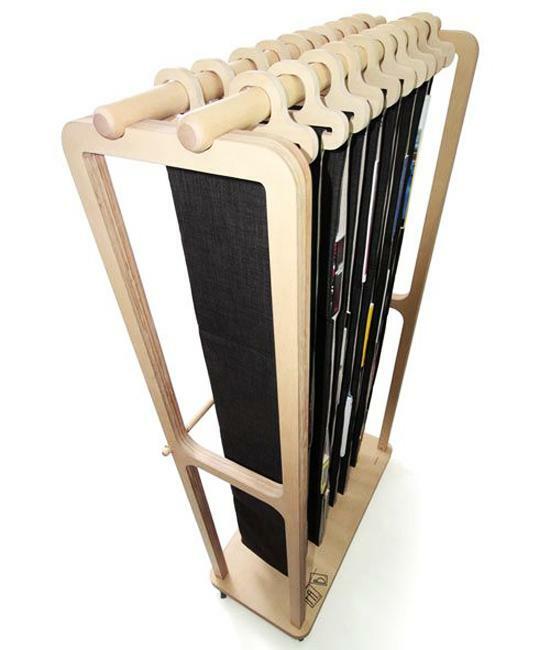 The rack with movable bookmarks holds the books in different sizes. 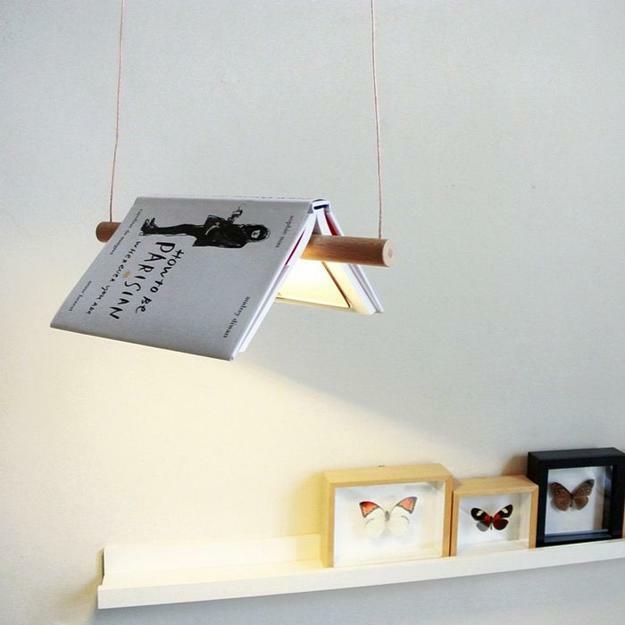 Young Dutch designers Cim Froeling and Tessa Kuyvenhoven created a ceiling lighting fixture with a book, metal wire and a round bar made of light birch wood with LED light. 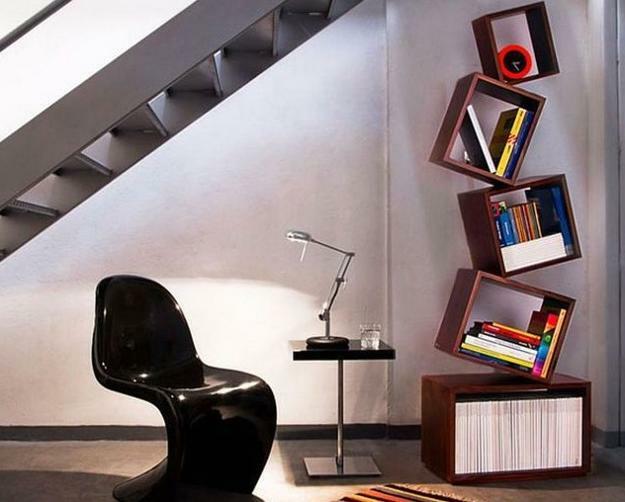 The alternative book storage ideas inspired this modern lighting design. 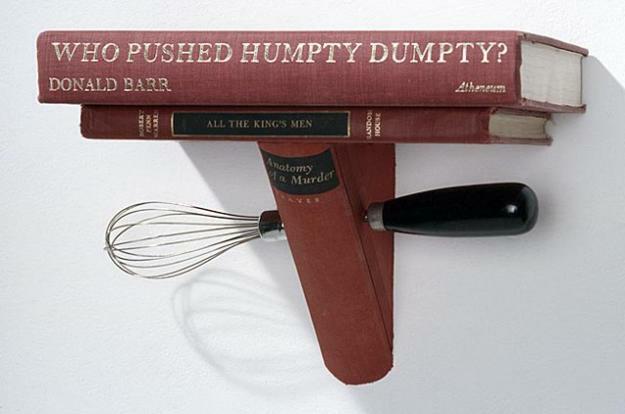 American designer Jim Rosaneu offered to recycle books for making wall shelves. 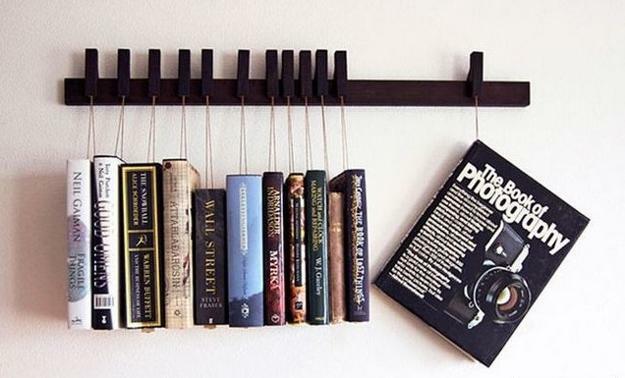 These modern wall shelves create interesting design in vintage style. 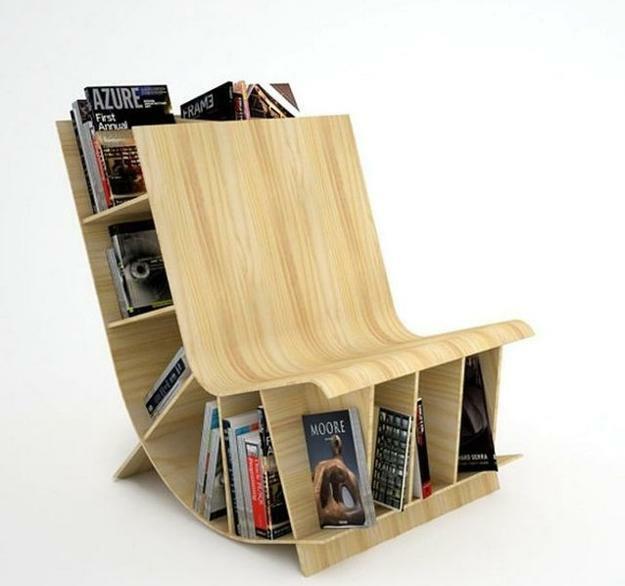 Books can be used for making large bookcases, tables and chairs also. 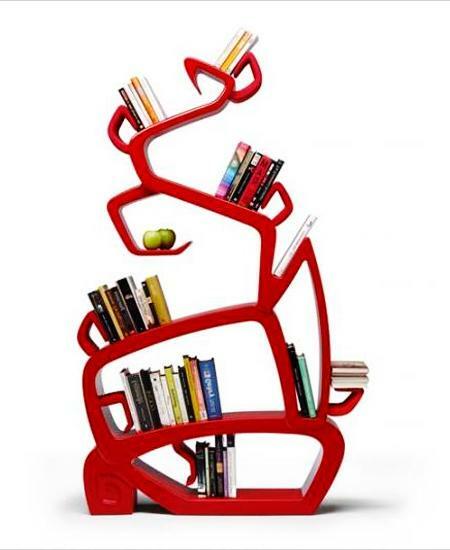 he Wisdom Tree shelving unit shows creative design inspired by the biblical story of the forbidden tree of knowledge. 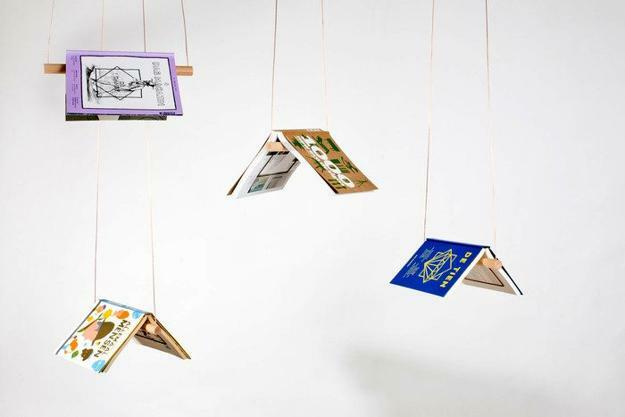 Jordi Mila from Spain designed the book storage unit thinking of the Garden of Eden. 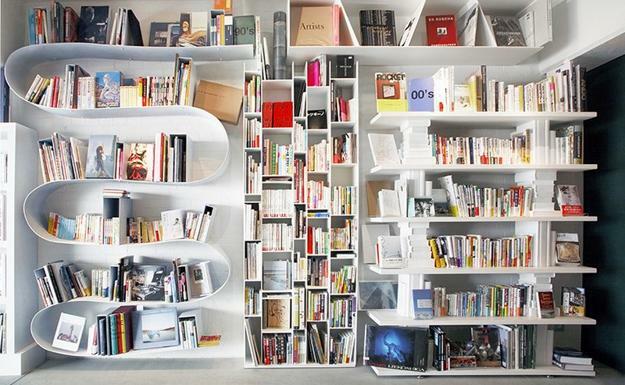 Alexi McCarthy designed unique wall shelving system for book storage that bring fun into interior decorating. 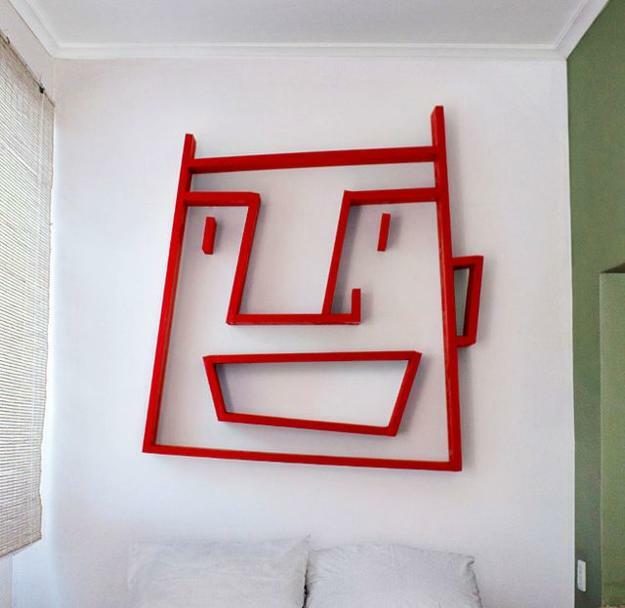 Depending on what you put on the shelves you can create different facial expressions and add more hair to the funny face. 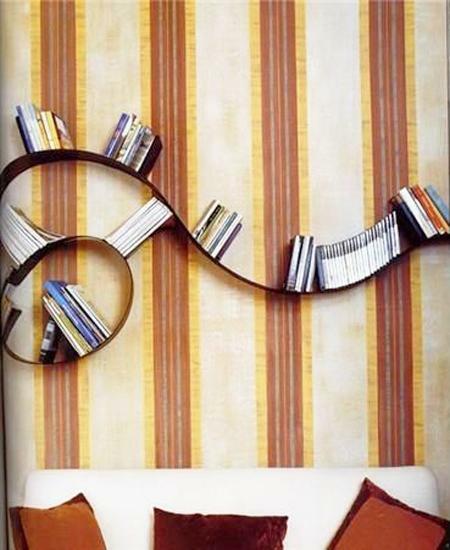 Creative wall shelves add modern design and originality to interior decorating. 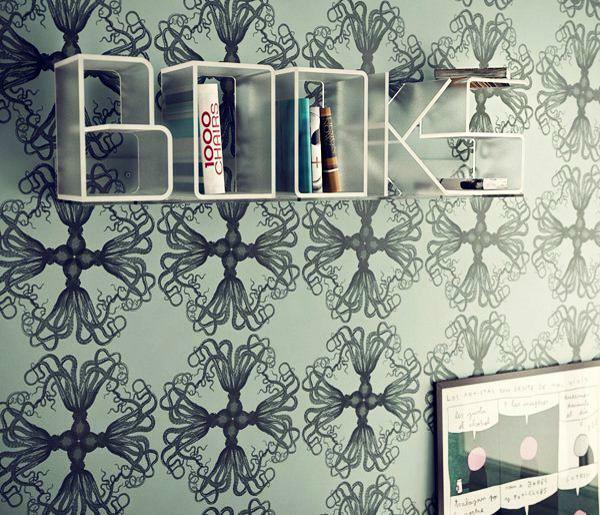 There are many different book shelves solutions, traditional and contemporary, artistic and formal, but unusual wall shelves is a way to impress your personality while personalizing your living spaces and bringing joy into modern interior decorating.